You don’t just want any bookkeeper to help you with your business you want the best bookkeeper you can find in your area. One who is flexible and understands your business needs. Trust, the right qualifications and someone who can provide you with the information you need in plain English is what you are looking for. So how do you find the right bookkeeping fit for your business? I’ve been a Sunshine Coast bookkeeper helping businesses like you with their bookkeeping needs for the past 16 years and this is what I think makes for a super bookkeeper. Your bookkeeper should be qualified and be part of a recognised bookkeeping organisation like AAT (Australian Accounting Technicians) They should be a BAS Agent registered with the Tax Practitioners Board so you can be satisfied that your bookkeeper has the required skills, qualifications and experience to correctly code your accounts for GST and prepare your BAS. Use this link to check if your bookkeeper is registered. Price sometimes relates to experience but if you are simply comparing hourly rates, a more experienced bookkeeper may seem expensive but they are most likely to work significantly faster and smarter. From my own experience I can get done in a couple of hours what may take a less experienced bookkeeper a full day. Taking the time to get to understand how you and your business work and adapting the bookkeeping process and software to work as simply and efficiently as possible avoiding time spent on unnecessary processes. Asks you lots of annoying questions. This may not seem like a plus but it is. Bookkeepers are more hands on and are able to ask questions to ensure transactions are correctly allocated, it is better that your bookkeeper ask questions rather than guess. Good bookkeepers know when to get advice from accountants and are not afraid to say “I don’t know’. Bookkeepers have a role and Accountants have a role. Up to date and well informed. As I write this I’m on the train home from a day in Brisbane learning all about the new features and the future of Reckon Accounts the accounting software I use and love. It is important that your bookkeeper is up to date with what is happening in the bookkeeping, accounting and technology spaces. The bookkeeping and accounting industries have evolved considerably over the past few years due to changing technologies. Your bookkeeper should be keeping you up to date with technology to save time and money by automating processes with cloud accounting packages such as Reckon One or Reckon Hosted the latest offerings in cloud software. If I was asked what was the most important thing in my business I would have to say it was the relationships I have built with my clients. The trust that my clients put in me sharing their financial detail and lives is something I will never take lightly. Bookkeeping is not fun but necessary so it helps if like your bookkeeper and feel comfortable discussing your business honestly and openly with them. Your bookkeeper needs this transparency to help you get the most out of your accounting software and bookkeeping. Posted in BAS Help, Beat the bookkeeping blues - Sunshine Coast bookkeeper, Bookkeeping, Bookkeeping training, Reckon Accounts, Sunshine Coast Bookkeeper. Tags: bookkeeper Sunshine Coast, bookkeeping Sunshine Coast, business bookkeeping, Cloud bookkeeping, Reckon training, Sunshine Coast bookkeeper on April 24, 2015 by Gillian Smith. Does BAS preparation make you panic? Not quite confident you’ve got it right? Could a Registered BAS Agent and Sunshine Coast Bookkeeper remove the stress? Many business owners aren’t thrilled about doing their Business Activity Statements. They find them complicated and time consuming to prepare and often leave them till the last minute. You also want to be sure you get it right, avoiding underpaying or overpaying tax or worse getting stuck with fines from The Australian Tax Office. As a Sunshine Coast Bookkeeper for the past 16 years, I find It makes sense to use an appropriate bookkeeping software to help you keep accurate records of your GST and PAYG liabilities making it easier to produce and check reports prior to lodging your BAS. If books are kept up to date BAS preparation becomes a much simple and time effective exercise. It also makes sense to hire a registered BAS Agent who is familiar with the accounting software you use so that they can create the necessary reports, checks and BAS preparation required for you to meet your obligations with The Australian Tax Office. “Registered BAS agents” were introduced as part of reforms in the Tax Agent Services Act 2009. It created a clear set of training, experience and professional standards a bookkeeper must achieve to offer BAS services for a fee or other reward. • agents are bound by a strict code of conduct and their registration is terminated if there is misconduct. • agents continually undergo professional development. • professional indemnity insurance that protects you financially if the agent makes an error, omission or some other act. • at least 1,000 hours relevant work experience in the three years before registering. This gives your BAS agent the experience and knowledge to produce your BAS reports accurately, and on time. It is important that you work with your BAS agent/bookkeeper to ensure that accurate records are provided and you allow enough time for them to prepare and lodge the Business Activity Statements for you. If you answered yes to the questions at the beginning of this article it is definitely worth hiring a BAS agent/bookkeeping in your local area to assist you with implementing systems to make BAS time just that little easier. Posted in Bookkeeping, Reckon Accounts, Sunshine Coast Bookkeeper. Tags: BAS preparation, bookkeeper Sunshine Coast, Business Activity Statement, GST, Reckon Accounts, Sunshine Coast bookeeper, Tax help on March 6, 2015 by Gillian Smith. There are a number of software accounting packages available and you can usually download a trial to see which one has the best functionality to work in with your business. As a Sunshine Coast Bookkeeper I have been using and working with Reckon Accounts (formerly QuickBooks) for the past 16 years and still enjoy it. They offer desktop and cloud solutions and have a range of products to suit any size and shape of business. Once you choose the software you like invest in getting hands on training so you get set up correctly from the beginning and get the most from you accounting software. Posted in Beat the bookkeeping blues - Sunshine Coast bookkeeper, Bookkeeping, Reckon Accounts, Reckon Training, Sunshine Coast Bookkeeper. Tags: bookkeeper Sunshine Coast, business solutions, cloud software, Reckon Accounts Training, Sunshine Coast bookkeeper on March 2, 2015 by Gillian Smith. It is a handy feature to keep track of tasks you want to complete by a certain date. You can look at your notes in the To Do list at any time, or you can use the Reminders list to see the notes whose dates are due. To Do List is under the Company menu at the top of the page. Click To Do at the bottom of the list and then New. Enter the note as you want it to appear on the To Do list. Enter the date in the Remind me on box and this will also appear on your Reminders list. *Be aware that if you create a To Do note in multi-user mode, everyone using the company file can see the note. Posted in Beat the bookkeeping blues - Sunshine Coast bookkeeper, Bookkeeping, Reckon Accounts. Tags: Reckon Accounts, Reckon Accounts Training, Sunshine Coast Bookkeeping on February 6, 2013 by Gillian Smith. Like many business owners you may find it difficult to justify time spent on bookkeeping when you feel your energies could be put to better use in other areas of building your business or following your passion, but bookkeeping is simply an indispensable tool for helping you maintain a healthy business. Keeping your books up to date and in good order actually will save you time and money in the long run and assist you with making better business decisions. 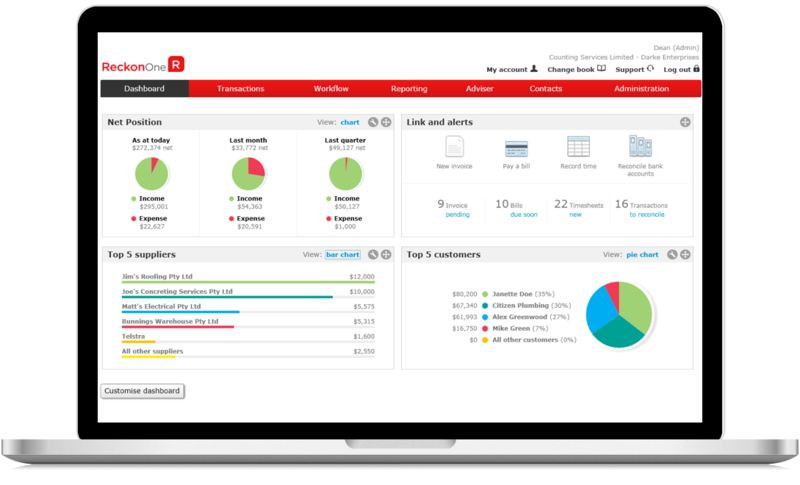 Accurate bookkeeping not only keeps you up to speed with your spending habits but can also track time spent on jobs and lets you know how much you are making per job. When your paperwork is in order and easily accessible looking up suppliers bills and following up on client payments is a snap. By updating your bookkeeping regularly and keeping your source documents in order you can easily see what areas of your business are more profitable than others and make business decisions accordingly. Reports can be quickly compiled and provided to financial institutions, accountants, advisers and of course the taxman. As they say it is not rocket science. Basic bookkeeping is simply the process of working out how much comes in and how much goes out. As a business owner your aim is to have more coming in than out and the only way to achieve this is to learn to view bookkeeping as something to be embraced not an annoying chore. Today with all the wonders of technology there a number of easy to use computer bookkeeping programs such as Quick Books (Reckon Accounts). You can have them locally on your computer or they can be cloud based which enables you to access your books from anywhere in the world via the internet. The most important key to good bookkeeping is to set aside a regular time each week to bring all your records up to date and to ensure you or your staff get the proper training in both basic bookkeeping techniques and appropriate software. If, like many business owners you feel your time is better spent elsewhere or you simply can’t stand bookwork then you need a consultant bookkeeper who can assist you with all or part of your bookkeeping needs. At Beat the Bookkeeping Blues we can help you with all areas of setup and training and hands on bookkeeping from basics to business activity lodgement. Posted in Bookkeeping. Tags: bookkeeper Sunshine Coast, bookkeeping for small business, bookkeeping Sunshine Coast, Bookkeeping training, QuickBooks Training, Sunshine Coast bookeeper, Sunshine Coast Bookkeeping on January 21, 2013 by Gillian Smith. All businesses small and large need a good bookkeeper, either on your staff or an outside consultant. If you have the staff they need to be trained properly on appropriate software and basic bookkeeping. Or you need to find a consultant bookkeeper to properly record the financial activities of your business. Without good bookkeeping your accountant can't properly do their job. In fact, many accountants may not take on your business if your books aren’t in proper order and compiled by a reputable bookkeeper. It is becoming common practice for bookkeepers and accountants to work together and they may even overlap in some of the services they offer. You may wish to handle your own bookkeeping. This can work (if you have the time) by using a BAS agent to review and check your books quarterly and an accountant to review and prepare tax annually, all working as a team for the benefit of your business. Alternatively you need to use a qualified registered bookkeeper to accurately record and report the business's financial information, saving you, the business owner time and money and most importantly leaving you to focus on the job of running your business. Posted in Bookkeeping. Tags: bookkeeper Sunshine Coast, bookkeeping for small business, Bookkeeping training, QuickBooks Training, Reckon, Sunshine Coast bookeeper on January 7, 2013 by Gillian Smith.